In Part 1 of this series, we saw what symmetric relationships are, how to model them on the back-end (using Rails) and how to implement a simple app that displays such relationships in Ember.js, adhering to the JSON API specification for serializing data. The solution we came up with worked but was a very naive one. For N relationships a resource had, it made 2N+1 queries to the back-end to display them. We should do better and in this post we’ll see how. We’d observed that for each person whose friendships we wanted to observe, our application made 2N+1 requests. One to grab the friendships themselves, and then two requests for each friendship in that collection, one to fetch the friender, one to fetch the friended person. We also noticed that those people (instances of the Person model) had already been fetched at that point so the extra requests were for nothing. Our mission is thus to reduce the 2N+1 requests to a single one, the one that fetches the friendships. How would Ember (Data) know? If we take a look at the data returned by the request for friendships, you can see that both the friended and friender end of each are just links with no type or identity information (like /friendships/1/friended). This is all that’s needed for an asynchronous relationship, since the client (Ember Data, in this case) can just fetch the relationship data when/if it needs it. We have now achieved what we’d wanted and only have to make one request per person to fetch and display their friendships. Nothing fancy going on, we check which end of the relationship the person in question (the model) is, and then only return the other end. Hopefully you can now implement a symmetric relationship with relative ease, the next time you encounter it. I made the source code of both the Ember app and the Rails API available on Github. If you want to learn more about the jsonapi-resources gem, I suggest you visit the documentation site. Finally, if you’d like to receive the series as a pdf, fill out the form below and I’ll send it to you right away! In data modelling, a symmetric relationship is a special kind of relationship where the description of the relationship from the perspective of one end of the relationship is identical to looking at it from the perspective of the other end. Friendship between people is a good example. If Megan is Selma’s friend, it follows that Selma is Megan’s friend, too. On the other hand, the “knows” relationship between two people is not a symmetric one. I might know Danny Carey (the drummer of Tool), but that does not imply he knows me. My research into how to model and implement such a relationship in an Ember application was sparked by this Stack Overflow question that was posed by a reader of my book. It was more difficult than I thought it would be so I was intrigued to find the (an) answer. My solution turned out to have a fairly large API component, too, so the following post will show both the server-side implementation (in Rails) and the client-side one (in Ember). If you don’t speak Rails, fear not. The code is straightforward and easy to understand without any substantial Rails knowledge, thanks in most part to the gem that makes it extremely easy to serialize data models and relationships to json:api format, jsonapi-resources. We’ll start with the data modelling part, which is the Rails side. To be able to model our problem in the data layer, let’s say that Friendships have a friender and a friended end of the relationship and a strength attribute that measures how strong their friendship is. We select the friendships where either the friender or the friended is the person we query it for. This is where the symmetric aspect of the relationship is implemented. We don’t care if the person friended somebody or if that somebody friended him, they are friends. Note that modelling it this way, we could split up the symmetric relationship into the two constituent parts. We could return only the friendships where the person in question “initiated” it (was the friender), or “let himself be friended” (was the friender). This gives us a jsonapi:resource generator that we can use to create both the endpoints and the serializer for our resources. 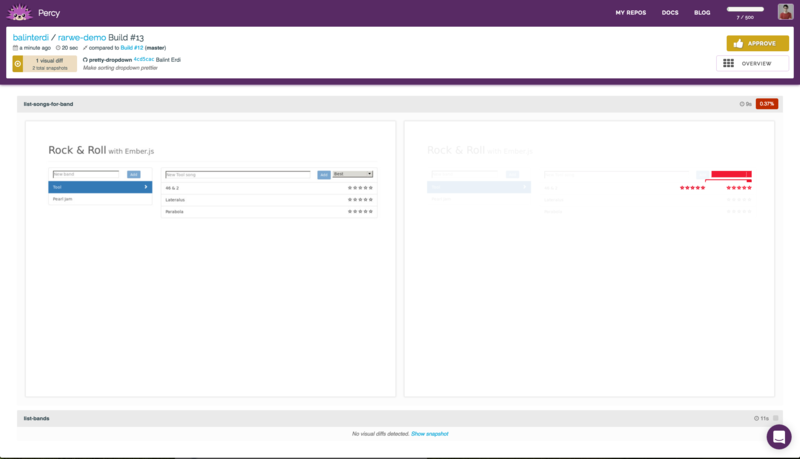 The back-end is now done, we can switch our focus to the Ember app. We want a list of people (rock stars, of course) and then have a list of their friendships on the person details page. This is rather standard Ember Data stuff, possibly with the exception of the inverse definitions. Since we have two relationships between Person and Friendship we need to specify the other end of each relationship and that’s what we do with the inverse option. With the models and routes in place, we can now see what the templates should look like. The each loop iterates through each person and renders a link for each of those that will take us to the person details page, which will display the person’s friendships. For each friendship the person has, two requests are sent to the backend. One to fetch the friender and another one to fetch the friended person. This is not an N+1 query problem, this is worse, a 2N+1 query problem! On top of that, those requests are sent for no good reason as we’d previously loaded the people referred by those friended and friended relationships. In the next part, we’ll see how these wasteful requests can be eliminated and we’ll also make the person details page less perplexing by not displaying the person whose page we’re looking at in the relationships. Stay tuned! I just published an updated version of the Rock and Roll with Ember.js book. The app now runs on 2.9.1 and there are only a few really minor changes this time. If you’re looking to get started in Ember, I encourage you read a sample chapter below. What is FastBoot and why should you use it? Another advantage is that search engine crawlers will have an easier job indexing your site, which brings SEO benefits. I recently went through the process of enabling the demo version of the Rock and Roll application to run in Fastboot. Below, I’m going to tell you about the challenges I encountered and how I overcame them in the hope that my journey will prove valuable when you do the same for your app. from the project’s directory and had the node server serving my application at port 3000. 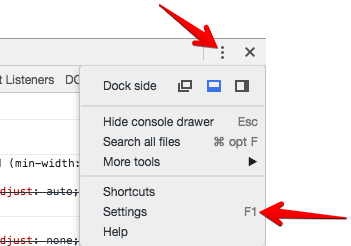 It’s important to note that you should refresh your browser tab each time you make changes to your code as FastBoot doesn’t (yet) auto-refresh the way ember server does. My first obstacle turned out to be Mirage. Mirage is a great tool for mocking server responses and even prototyping your Ember app. I used it in development, too, and it turned out that since it turns itself off when your app is running in FastBoot mode, the requests hitherto handled by Mirage now went out and were thus unhandled. The fix here was to disable Mirage in development (and, in my case, production, too) and to make the requests against an actual API. You also have to add the hosts that will serve your Ember app in FastBoot mode to a list called hostWhitelist in your app’s configuration. When I restarted the ember fastboot and looked at the server-rendered version of my app, I saw that the dynamic data was now correctly rendered on the page. However, it did not have any styling. Since Fastboot runs your Ember app in a node environment, not in the browser, document is not present. In my case, I accessed document (through jQuery) to set the document title, which does not work in FastBoot mode. The next thing that did not work was that the songs for a specific band did not load in FastBoot mode, the list of songs was empty each time. As you can see, I only pre-fetch the songs in FastBoot mode. In the browser, I let rendering start earlier, with a “pop-in” effect (which can be remedied in several ways in the browser, too). You can read more about this in the “Use Model Hooks to Defer Rendering” section of the guide. It’s fine to have FastBoot working in development but nobody actually needs it to work in that environment. It has to work when deployed to a server. The guide has a whole page on deployment, listing several deployment options, from which I chose Heroku as it seemed the easiest option. And it really was. This step is really only needed to change the default https_only setting. If you have SSL set up for your domain, you don’t need the static.json file. The next time I pushed to the remote set up by Heroku, it just worked, and my app was now FastBoot enabled. Hooray! I would like to thank Adolfo and Jonathan for their help in pointing me at Ember Weekend, an Ember app that runs in FastBoot and whose source code is publicly available, and also for overcoming the above mentioned “missing dynamic content” problem. My app does not use many of Fastboot’s features. 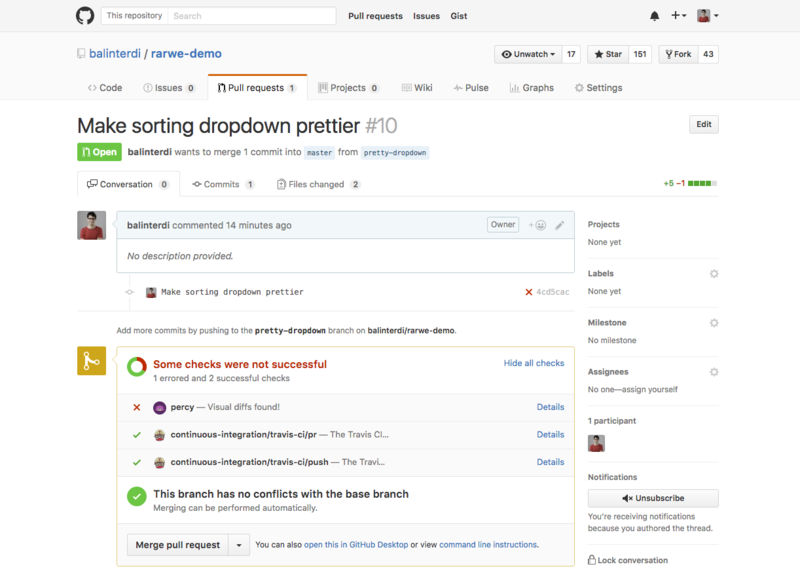 If you’re looking to see a more complex use case, check out the Ember Weekend source code. If you want to learn more about FastBoot’s architecture and rationale, I recommend checking out Tom Dale’s great presentation he gave at Global Ember Meetup. 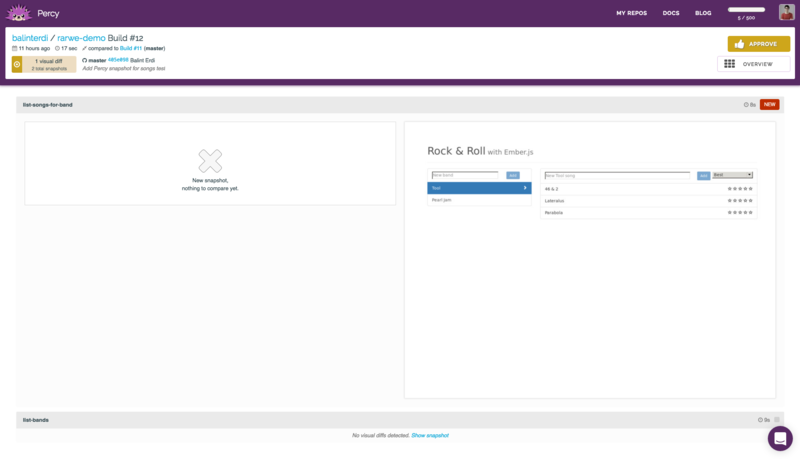 Finally, the Rock and Roll demo app that this post describes is available on Github at balinterdi/rarwe-demo and deployed to http://demo.rockandrollwithemberjs.com. I recently watched Mike Fotinakis’s presentation at the San Francisco Ember meetup, Continuous Visual Integration with Ember, and I’ve become really enthusiastic about visual diffs, and Percy. It’s really worth the time and I highly recommend to watch it. I could say “watch it now and then come back” but it’s a 50-minute long video while this post takes 5 minutes to read, so I recommend to do it the other way around: read this post first and then go and watch the presentation where he goes into more details on what visual diffs and CI are, how Percy works and answers to questions from the audience. Ready? Cool. Start the timer and let’s go. I will give you the high-level definition and rationale of visual diffs and continuous visual integration as the post otherwise wouldn’t make sense. However, that’s just the code part. There are other ways to break a web application, a major one among them is for the app to look differently than before, in an unintended way. The background color of a button might change, a link could have become hidden, or a css file could no longer be downloaded which all lead to a degraded visual experience for visitors of the app. To automate the process, we integrate the generation of visual diffing in the automated testing process. 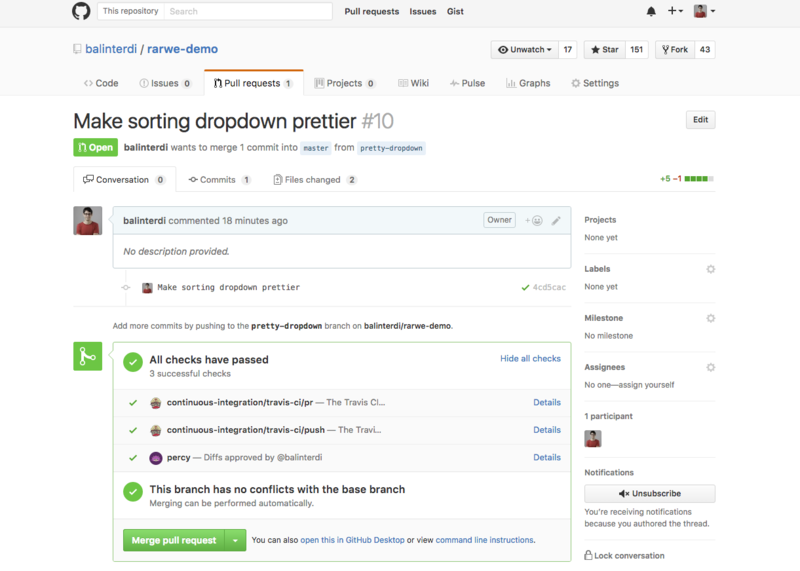 This will produce the “before” and “after” screenshots that will be used to generate the diffs. Let’s see how this is done in practice. NOTE Starting from ember-percy version 1.2.4, you no longer need to do the above as ember-percy doesn’t use Mirage anymore. Just as with “normal” tests, the more snapshots we have, the higher the chance we did not introduce any regressions with our latest changes. Mike recommends a “breadth first” approach, making screenshots from tests that verify different scenarios instead of a “depth first” approach, creating several screenshots for the same scenario. I’m all sold on visual diffing and I think there is tremendous value in securing our apps this way. I encourage you to watch Mike’s presentation and sign up for Percy to become a better steward of your applications. Setting back isLoading to false is conveniently placed in a finally handler so that it happens both if the promise resolves successfully (the band is saved) and if it is rejected (there is an error during the save). I know I have written this hundreds of times by now and it has increasingly disturbed me that setting and unsetting the loading flag is boilerplate code, something that could be refactored. Since saveWithLoadingFlag returns a promise, we can add our own handlers to it, including other finally handlers. You can find a working example here, where you can play around with it. 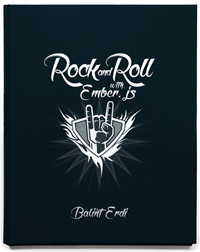 Yesterday I published an updated version of the Rock and Roll with Ember.js book. The app now runs on 2.8 (Ember CLI, Ember and Ember Data) and, as usual, there are a few other changes. The biggest of these was updating the Deployment chapter. PageFront seems defunct so I replaced it with Surge. Above that I also updated the section on deploying (to S3) with ember-cli-deploy as things have changed quite a bit. You can check out the full list of changes here or the book itself here. PSA: Ember 2.9 will bring the long-awaited new rendering engine, Glimmer 2! I already went ahead and updated the app to 2.9.beta to give it a whirl. I encourage you to try switching your app to Glimmer 2 and see if you encounter any problems. Today marks the release of the Rock and Roll with Ember.js book, version 2.7, which means the app built in the book now runs on Ember 2.7 (and uses Ember CLI 2.7). There is a number of other small fixes, the full list of which you can see here. Testing is given much emphasis in the Ember.js community, and testing tools have showed steady progress to reduce the cost of writing tests of all types. Lauren Tan wrote a great post about how Dependency Injection (DI) can be used to decouple a parent component from the internals of its child components. One of the gains of doing so is that the parent component becomes more focused and thus easier to test. In this post, I’m doing something similar, although much simpler. I want to show you how to use DI in a simple helper function to make it easier to test. Although the helper is an Ember (template) helper, the concepts could be very easily transferred to other frameworks, libraries and even languages. This is exactly what Dependency Injection can help us do. Instead of hard-coding that “sanitizer” function dependency, the function could take it as a parameter so that callers could inject it. Usually DI examples use (and thus inject) class names or object instances but it is important to realize that the injected param could be very “primitive”, like a simple function. If no sanitizer key was present in params, then it will have a value of Ember.String.htmlSafe, the default behavior. We’re now comparing simple strings which place nicely with assert.equal (with ===), and our test now passes. Code modifications introduced for the sake of testing usually also improve the non-testing aspect. Here, we made it possible to pass any function before we return the normalized text. We could, for example, use this to replace the <p> tags with <span>s, if we so wish. I do Ember.js consulting. If you have a project that needs help, contact me and let’s start talking.